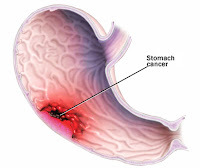 Looking for an easy way to lower your risk of stomach cancer. You may want to, considering that it's the fourth most common type of cancer and the second most deadly. All you have to do is eat a moderate amount of a certain kind of food. In a new study out of Europe, researchers found that women who ate higher amounts of foods with flavonoids were half as likely to develop stomach cancer as were women who ate the smallest amounts. Women who ate more than 580 mg of flavonoids per day had a 51 percent lower risk of developing stomach cancer than women who ate 200 or less mg per day. So, what foods contain flavonoids? Look for plant-based foods including fruits, vegetables, whole grain cereals, nuts, and legumes. Tea's also on the list. And this should brighten your day. So is chocolate and wine. The researchers state that eating more flavonoids and cutting back on red and processed meat can be an effective one-two punch in reducing your risk of stomach cancer. Other risk factors for stomach cancer include smoking, drinking, and obesity. So there are plenty of reasons to eat flavonoid-packed foods. They can help strengthen veins and have strong antioxidant properties. They can also dramatically reduce your risk of stroke. So, enjoy plenty of fruits and vegetables, and go ahead and indulge in a little wine as you unwind at the end of the day. You'll be getting some serious health-boosting nutrients while you do. If you find that you may need good antioxidant support, check out Enriching Gifts Red Heart Algae, Enriching Gifts Metabolic Complete, FEBICO Natto Complex or Wellgenix Resveratrol.